On Saturday night at the Warfield in San Francisco, Mitski entered the stage to the loud, buzzy guitars of “Remember My Name,” her hands clasped neatly behind her back. She stood stock-still throughout the entirety of the first song, staring ahead with a measured intensity. Soon, she would replace unnerving stillness with highly theatrical dance moves, but her intensity was unwavering. With the release of her newest album, Be the Cowboy, the indie rock singer-songwriter has taken an entirely new approach to her stage presence. In interviews, she has spoken about not being naturally inclined to act outgoing on stage, preferring to stray away from lengthy stage banter. But the character Mitski based Be the Cowboy on translates perfectly to the stage. Partially inspired by the protagonist from The Piano Teacher, partially inspired by a part of her own personality, Mitski plays a woman who feels powerless and overcompensates by taking on an extremely controlled exterior — but she’s so repressed that her inner emotions begin to slowly creep outside the margins of her body. On stage, Mitski fully embodied this character, slowly unravelling throughout the length of each song. Some songs she acted out with gentle, graceful hand movements, such as miming taking a drag of a cigarette during “I Don’t Smoke.” During others, she let the inner turmoil beneath her words show — during “Francis Forever,” she paced the stage back and forth, gradually picking up speed, and with it, anxiety. During “Dan the Dancer,” she kicked her legs up in the air while draped over a folding chair. Other songs found her fully thrashing on the floor or clutching at her chest, acting out an artistic rendition of a child’s tantrum or even a spurned lover. With such a deliberately executed performance, it was cathartic to see Mitski finally jump around enthusiastically at the end of “Happy,” the opening track from her 2016 album Puberty 2. But even tossing her head back and forth and throwing her arms to the sky, her movements still felt very detached from the reality of happiness — an uncanny, robotic performance of it rather than pure joy. Mitski dropped the theatrical dance movements at the end for two of her slower, more heart wrenching songs — although, if we’re being honest, every Mitski song is a tearjerker. Her haunting, world-weary vocals rung out mesmerizingly over acoustic guitar on “A Burning Hill” — the first time she picked up an instrument during the set. She ended with “Two Slow Dancers,” the album closer on Be the Cowboy that mourns a loss of youth and young love. 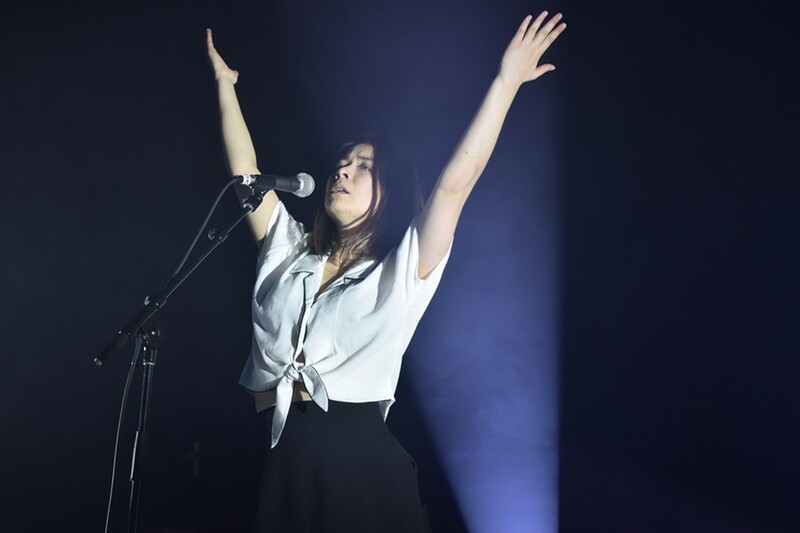 In typical Mitski fashion, by the song’s finish, there wasn’t a dry eye in the house.